Day two of our “Champagne and More” wine tasting tour got off to an uncharacteristically early start. Fortified by our Hampton Inn breakfast, we set off, intent on stopping in at two (at most) wineries and then checking out the Charles Schultz museum. Our first stop was described as a “can’t miss” by several well informed people. Within ten minutes of arriving at the Harvest Moon Winery, we knew that we had made the right choice. The fun began before we even reached the tasting room. The parking area looped around mature trees and grape vines heavy with berries. We looped around the driveway, looking for the perfect place to park, eventually settling for a nice, shady spot under a tree. Our wine was safe! 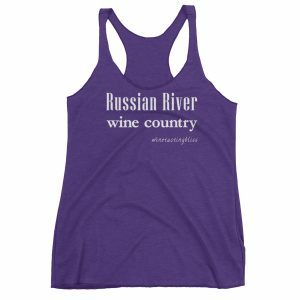 We made our way past the vines, past the antique car and the stainless steel wine vats. 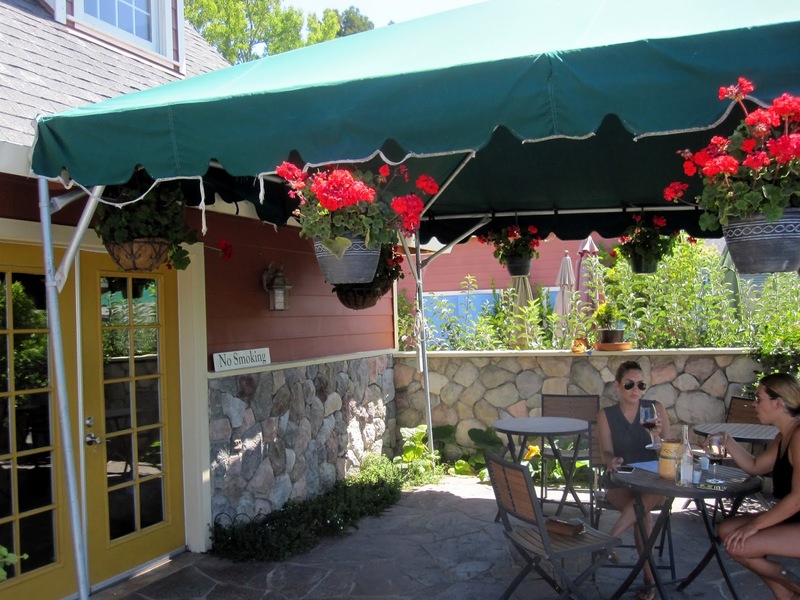 The entrance to the tasting room sported a covered patio with hanging flowers and tables. A perfect spot for a crackers and cheese break, but we had just completed breakfast so we merely made a mental note for a future visit. Onward, into the tasting room! As we entered we were immediately greeted by a highly energetic man behind the tasting bar. We quickly made the acquaintance of owner/winemaker Randy Pitts. He seemed to be even happier to be there than we were. Although there were two other groups at the bar, it felt like we were the only people Randy had to take care of. That takes a lot of enthusiasm and charm, but he pulled it off, seemingly without effort. We started with the 2013 Estate Dry Sparkling Gewürztraminer. We are not typically fans of Gewürztraminer because of the traditionally sweet taste. This was a happy surprise, not overly sweet, with much in common with a unoaked Chardonnay. A nice start to our tasting! As we moved on to the 2011 Pitts Home Ranch Estate Zinfandel, we learned a bit about Randy’s point of view on wine making. In a nutshell, he believes “more fruit, more character, less alcohol.” His Zinfandels certainly demonstrated the delicious result of this approach. Each Zin showed great balance, with huge fruit presence, some citrus zest and a bit of pepper. Quite unlike a typical Zin, certainly! 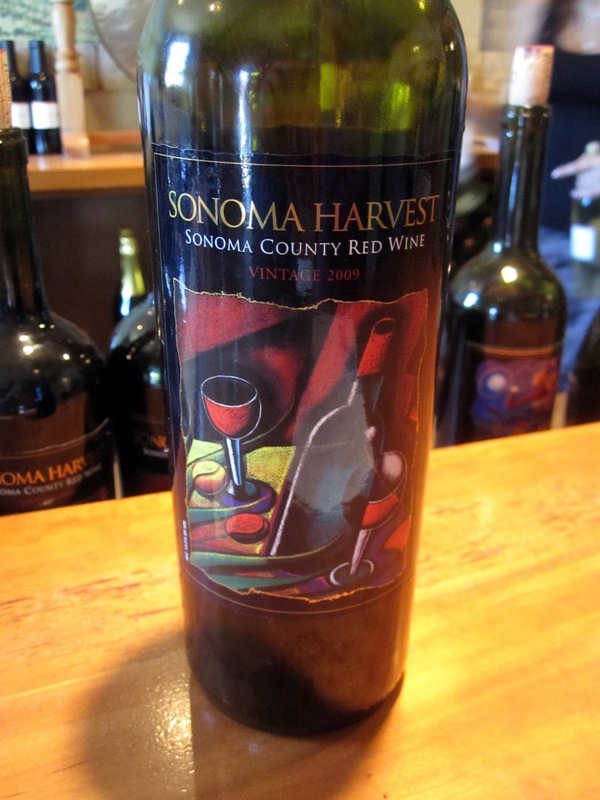 Another happy surprise was the 2009 Sonoma Harvest Proprietary Blend. This wine blends Cabernet Sauvignon, Cabernet Franc, Merlot, Syrah and Petite Sirah. Whew, just keeping the blending recipe straight must be a real chore! Randy called this his “little bit of the Rhone.” An elusive nose, with just a bit of smoke and leather, and hints of a stroll through a ferny forest. We loved the fruit notes, especially when we tasted a bit of chocolate first. This wine is really something special. We tasted our way through Randy’s several Pinot Noirs, too. 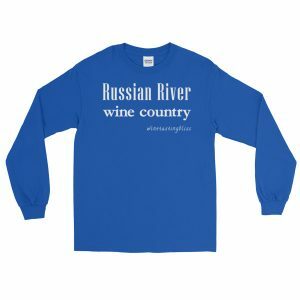 One favorite was the 2011 Pinot Noir – Russian River Valley. We found wintergreen, sandalwood and sage on the nose, with dark fruit on the palate and a long, slow, amazing finish. Next time we serve veal saltimbocca, this wine needs to be on the table. Another fun taste was the 2011 Randy Zin Blend. This is made from 80% Zinfandel and 20% Sangiovese. We loved the balanced yet complex layers of flavor, especially the bing cherry and bit of plum, with just a tiny pop of pepper in the finish. We successfully completed our tasting flight (plus a few surprises) and felt that we had made a new friend in Randy. 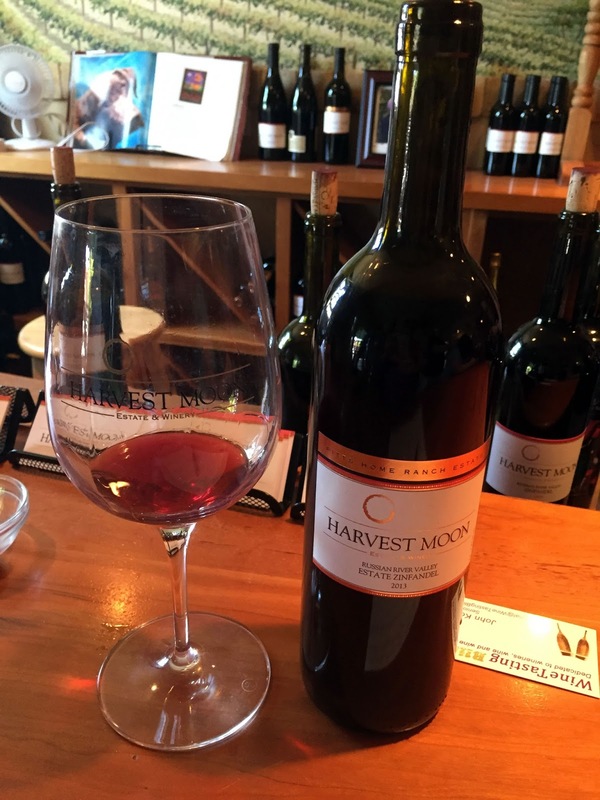 For a few minutes we seriously considered adding Harvest Moon to our list of wine clubs. The only reason we held off was our enrollment just the previous day in the Korbel Champagne club. One at a time, that’s our strategy. We need to cancel membership in some other wine club before we can take on a new one. 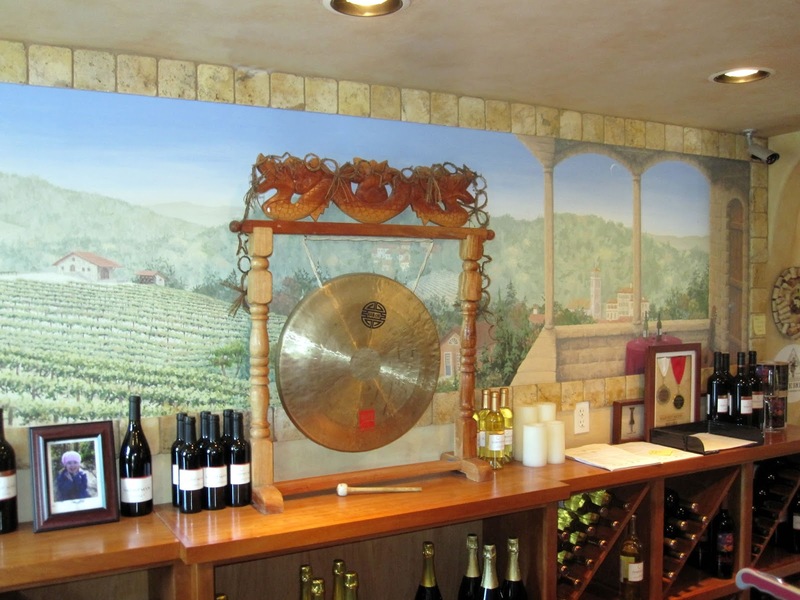 Harvest Moon definitely earned a spot on our “on deck circle” of wine clubs. Many thanks, Randy, see you soon! 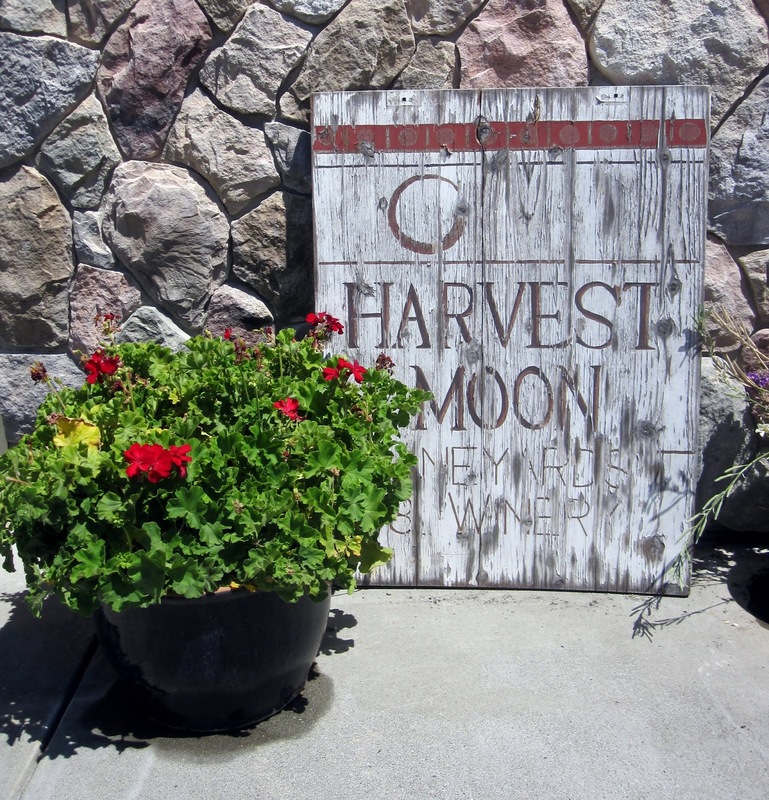 Have you visited Harvest Moon? Click to give'em a tweet of support!